Pattadakal is a small hamlet located near Badami and Aihole. This town is noteworthy for its incredible hoary temples. 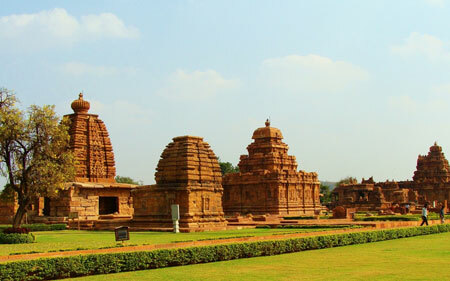 These temples in Pattadakal are the testimonies of 'Vesara' style of Hindu temple architecture. This archaic town is listed as a prominent world heritage site by the UNESCO in 1987. Pattadakal was once a flourishing nation under the rule of Chalukyas. During the 7th - 8th century, Chalukyan rulers contributed a lot in constructing these master pieces of architecture. Every temple found here are unique and shows a blend of Dravidian (South-Indian) and Nagara (North-Indian) architectural styles. The series of nine temple stands majestically and attracts every tourists who enter the threshold of Pattadakal. Among these set of temples four temples are built in Dravidian style, another four in Nagara style and Papanatha Temple reflects the perfect blend of both styles of architecture. Bu 8th century Kashivisvanatha Temple was constructed by the Rashtrakutas in north Indian style. The sculptures that found in here are marked by impeccable creativity and craftsmanship. Pattakal is a safe haven for those who love history and architecture. The temples of Pattadakal receive surplus tourists, from all over the world throughout the year. Pattadakal is surely worth the visit and it boast best architectural marvels. Visit this place for this vacation and admire its marvellous beauty.